As the tissues of the neck age and relax, an obvious central fold can develop under the chin in both women and in men. This is principally due to loose skin, not excess fat. Instead of the sideview (profile) of the neck going inwards (being concave) in this area, it sags outwards (convex) and can be the cause of considerable self-consciousness and possible loss of self-confidence. 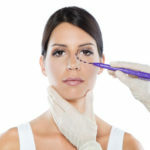 Whilst this can be addressed by a full facelift, including necklift, that extent of surgery may not be indicated or wanted, and in some people it may not be considered safe. Instead, the problem can be dealt with by an operation specifically targeted at the central fold – a Central Neck Reduction. Usually performed either under local anaesthetic (numbing mixture) and intravenous sedation (barely aware and little or no memory of the operation afterwards), or under full general anaesthesia (asleep), the procedure involves carefully freeing the skin of the fold, thinning underlying fat and then tightening the small central neck muscles to add tone. The skin is then redraped as three or four horizontal ‘tongues’ or ‘flaps’, which are tightened to take up neck slack centrally and then carefully stitched, after removing all the skin and fatty excess at the flap tips. This results in a gently curving closure line, running back and forth on the under surface of the chin and down to the level of the Adam’s Apple, to leave a scar which usually fades and matures well. The result is a restored concave profile and regained self-esteem. Although the procedure can be carried out as a Day Case and even under local anaesthesia with oral sedation (tablets) in those with plenty of composure, the intravenous sedation or general anaesthetic approach is more common, combined with a one night stay in hospital. Mr Erel would be happy to consider Central Neck Reduction with you in consultation and it should be noted that it can be combined with a Bilateral Mini-Facelift and/or Eyelid Reduction (Blepharoplasty).